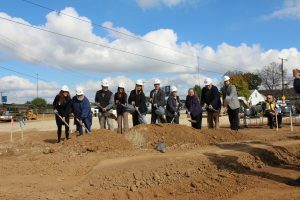 Moraine, Ohio—MedVet Medical & Cancer Centers for Pets, a leader in veterinary specialty healthcare, broke ground this week for expansion of the Dayton, Ohio hospital. Construction of a 19,000 square foot state-of-the-art veterinary hospital at their existing site at 2714 Springboro West, Moraine, OH is underway. The company’s commitment of $3.6 million will change many existing part-time jobs to full-time positions and add 15 new full-time jobs and expand current veterinary services to the Dayton area. Groundbreaking ceremony at MedVet Dayton November 4th, 2016. 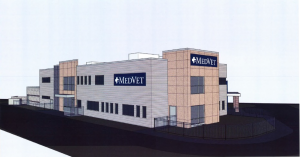 MedVet, headquartered in Columbus, Ohio, expanded its central Ohio presence to Dayton in 2012 in response to a growing demand for veterinary emergency and referral services in that region. They have outgrown their current 7,200 square foot facility. MedVet hospitals work very much like a human hospital. “We offer state-of-the-art emergency and specialty care to cats and dogs in partnership with referring general practices. The emergency room is open 24 hours a day, 365 days a year to serve clients and patients as an extension of the family veterinarian’s practice when their family veterinarian is not available,” says Schertel. 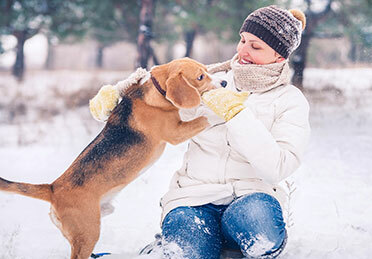 In addition to emergency services, MedVet Dayton offers specialty services in anesthesia and pain management, cardiology, dermatology, internal medicine, oncology, ophthalmology, radiology, and surgery. MedVet Medical & Cancer Centers for Pets, with headquarters in Columbus, Ohio, is a widely recognized and growing group of emergency and specialty referral veterinary hospitals for companion animals. MedVet, whose mission is leading specialty healthcare for pets, is employee owned and veterinary led. MedVet provides specialty referral services for in-depth patient care, as well as emergency services 24 hours a day, 365 days a year. More than 100,000 dogs and cats are treated annually at MedVet’s expanding network of medical centers across the country. MedVet hospitals were named the American Animal Hospital Association (AAHA) Accredited Referral Practice of the Year in 2014 and 2016, the only group of practices to receive this award twice. For more information on MedVet’s network of medical centers, visit www.medvetforpets.com. MedVet Dayton is conveniently located less than a mile off of I-75. MedVet Dayton’s board-certified specialists provide exceptional healthcare for pets supported by emergency services 24 hours a day, 365 days a year. For photos, tours and/or interviews, please contact Heidi Hill at MedVet Dayton at (937) 293-2714 Main, (937) 293-2787 Fax or Heidi.Hill@medvetforpets.com.